Aryo Barzan Hotel provides a comfortable setting while in Shiraz. It is conveniently located for guests wishing to sightsee in the area. This 4-star hotel provides 24-hour room service, a coffee bar and on-site parking. Guests can take advantage of the recreational facilities on offer, such as a dart board and billiards. 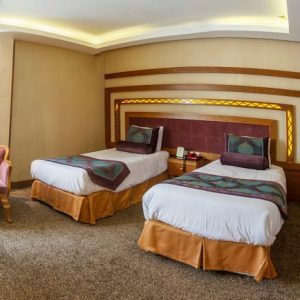 Each room at Aryo Barzan Hotel Shiraz features a refrigerator and all the necessities for a comfortable stay. They all include an in-room safe, a telephone and wireless internet access. Those staying at Aryo Barzan Hotel can enjoy a unique dining experience at the on-site restaurant, conveniently located for those who want to stay close by at mealtime. Shiraz International Airport is a 20-minute drive from Aryo Barzan Hotel Shiraz.